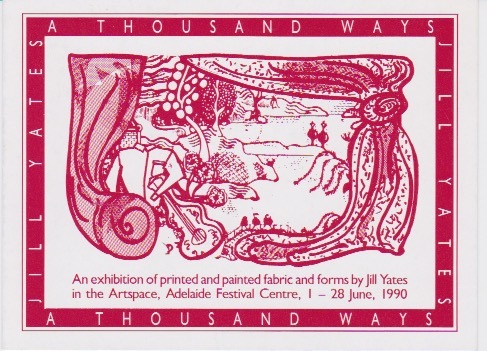 Vivonne Thwaites was Visual Arts Director, Adelaide Festival Centre for many years and was the Curator of the School of Art Gallery University of South Australia in 2006. In July/August 2006 she was awarded the University of Sydney Power Studio at Cité Internationale de Arts in Paris. 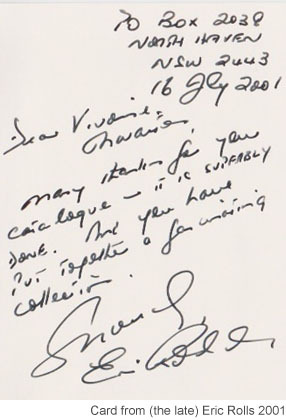 Vivonne has curated many exhibitions since 1994. Vivonne was awarded Arts SA and Australia Council grants for international research in 2013, travel to Stockholm, Åland, Helsinki, Berlin, Copenhagen, Malmo, Hässelholm and Göteborg. 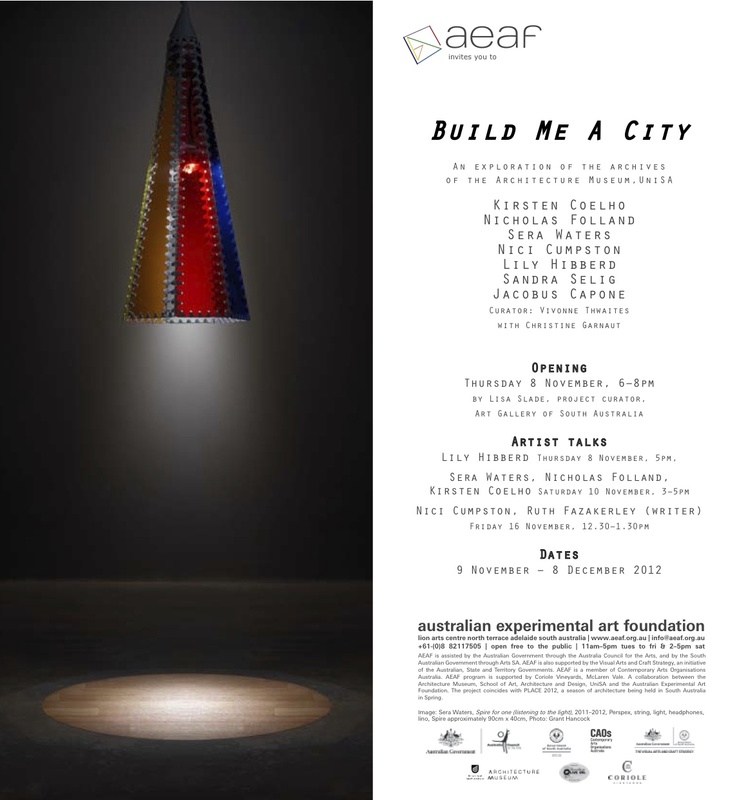 'build me a city' presented with the aeaf and the Architecture Museum Uni SA and the artists Lily Hibberd, Jacobus Capone, Sandra Selig, Kirsten Coelho, Sera Waters, Nicholas Folland and Nici Cumpston. This project was funded by Arts SA's New Exhibitions fund. Roads Cross with Fiona Salmon, Flinders Uni. & Anita Angel, Charles Darwin Uni. The project was funded by Visions of Australia. 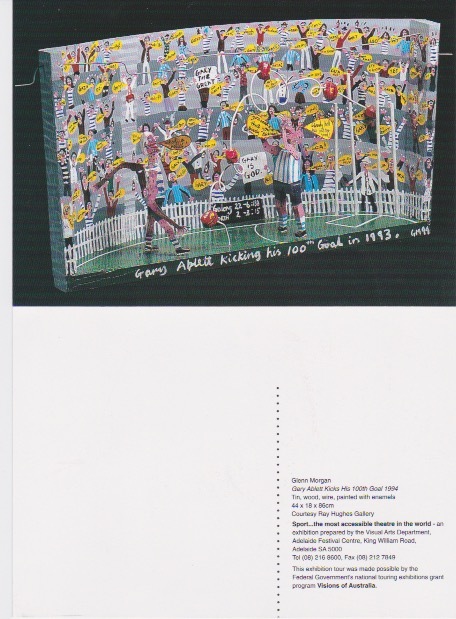 Review: Art Monthly - Issue 252 (Aug 2012) 'X' marks the space: Roads cross, Flinders University Art Museum, O'Riordan, Maurice. Home Stories curated in 2011 by Vivonne Thwaites for Adelaide Central School of Art in partnership with the Migration Museum. Home Stories was an exhibition in the Adelaide Fringe Festival. The exhibition included new works by Roy Ananda, Sera Waters, Irmina van Niele, Kylie Waters, Christine Aerfeldt, Lee Salomone, and Carolina Facelli. The project was funded by Arts SA. Littoral curated by Vivonne Thwaites with Professor Jean Fornasiero, French Department, University of Adelaide. A 54 page catalogue, Littoral, was published. The exhibition opened in Hobart at Carnegie Gallery, April 2010 and toured to Burnie Regional Gallery and featured the marine works of Charles-Alexandre Lesueur and responses from contemporary Australian artists, Aadje Bruce, Chris de Rosa, Julie Gough, Beverley Southcott, Toni Warburton, Judy Watson. 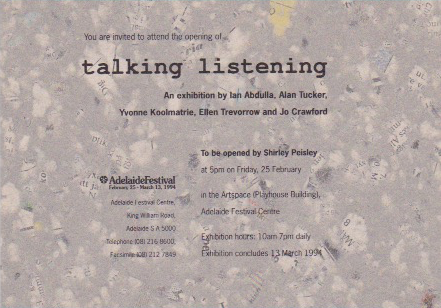 Adelaide Bank Festival of Arts project titled Writing a Painting, opened on March 1, 2006. This project was funded by Uni SA International, Arts SA, The Australia Council, The Gordon Darling Foundation, the Australia China Council and Asialink. Artists Robin Best and Helen Fuller with Nyukana Baker and Huang Xiuqian. Writers Vivonne Thwaites, Prof Nicholas Jose, John Kean and Mary Eagle. "Restorative peace, beauty and cultural connections flowed from Writing a Painting at the South Australian school of Art, the kind of art project that Adelaide always does well and in curator Vivonne Thwaites' hands, extremely well. This poetic and richly layered presentation (exploring Australia's relationship with China through recent work by locally based artists, Helen Fuller and Robin Best, in association with Huang Xiuqian of Jingdezhen, China and Nyukana (Daisy) Baker of Ernabella) pushed the persistent but seemingly coincidental undercurrent of cultural roots within the entire AF06 visual art program in other directions. " Tamworth Fibre Textile Biennial. Project title: in the world - toured nationally throughout 2007/08. Artists Beth Hatton, Jean Baptiste Apuatimi (Tiwi), Minymaku artists, Julie Gough, Irmina van Niele, Kay Lawrence, Ilka White, Sandy Elverd, Helen Fuller, Michelle Nikou, Bede Tungatalem, Rosemary Whitehead and many others. 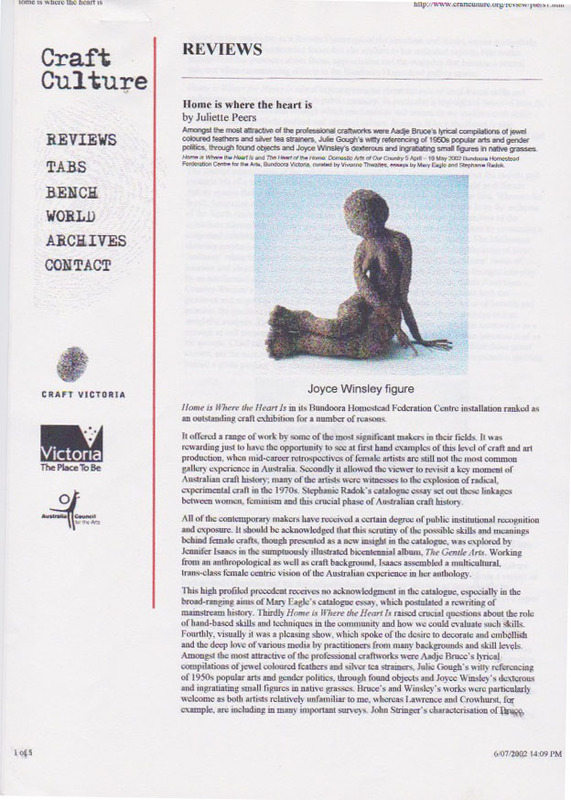 Catalogue essay Vivonne Thwaites, Australia Council and Visions of Australia funded. 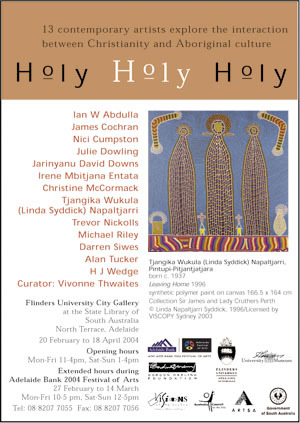 Holy Holy Holy was funded by Arts SA, The Australia Council’s Visual Arts Board and ATSIAB, The Gordon Darling Foundation, The History Trust and Visions of Australia. Holy Holy Holy was a project of the 2004 Adelaide Festival and toured nationally. This project looked at the impact of Christianity on Indigenous people in Australia through a range of works by contemporary artists and museum and social history material. Artists such as Michael Riley, Linda Syddick Napaltjarri, Darren Siwes, Jarinyanu David Downs, Ian W Abdulla, Irene Mbitjana Entata, Christine McCormack, Trevor Nickolls, Alan Tucker, Harry Wedge, Julie Dowling, Nici Cumpston and James Cochran are included and the writers Marcia Langton, Bill Edwards, Rob Amery, Mary Eagle, Varga Hosseini and Christine Nicholls explore the topic in the accompanying catalogue, Introduction by Vivonne Thwaites. This project was featured in articles in Art Monthly by Nick Waterlow and in Art and Australia by Tracey Lock Weir and was written up twice in The Age with full-page features in each instance. 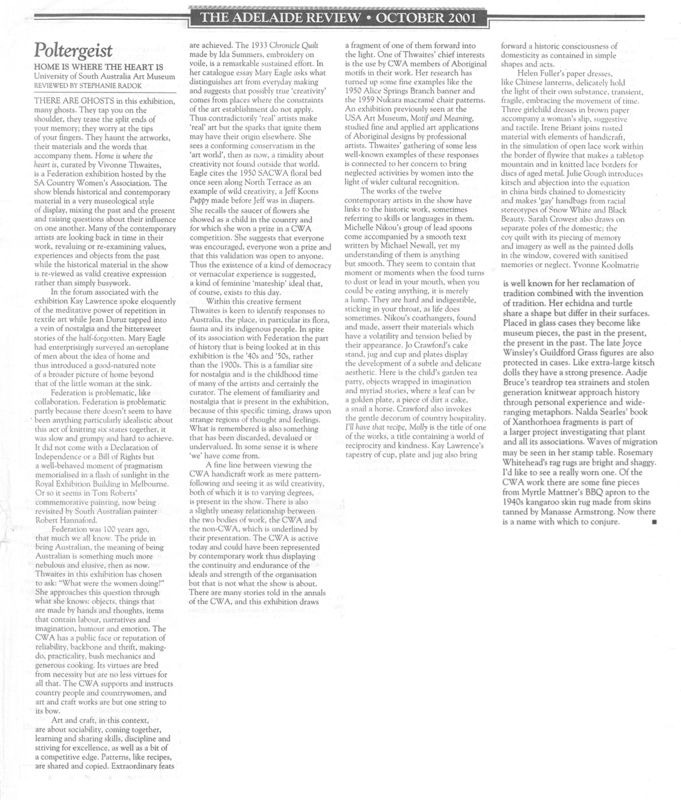 Review: Mighty but not merciful by Robert Nelson, The Age, Metro Arts, p 8, 29 June, 2005. – Bundoora Homestead Federation Centre for the Arts, Victoria, 5 April – 19 May, 2002. This project opened up new material on the CWA and its unique history in Australia. Connections between the South Australian Country Women's Association and an Indigenous Australia were a focus of this exhibition. The President of the South Australian Country Women's Association launched this project at the Art Museum, University of South Australia. 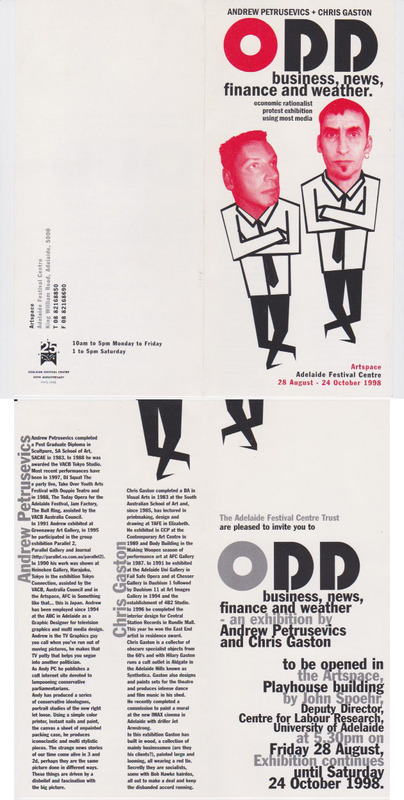 Public forum held Friday 14 September, 2001, 5–7 pm, Nexus Multicultural Arts Centre, Lion Arts Centre, Adelaide. Speakers were Dr Jean Duruz, Dr Mary Eagle and Prof Kay Lawrence. 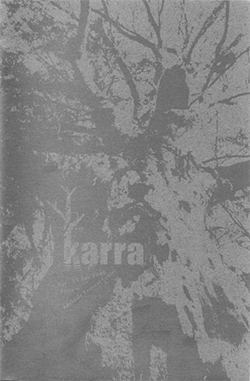 The catalogue for this project won the Award of Merit/Visual Communication in the Design Body Two Awards, Design Institute of Australia, November 2001 and the Gold Serif Award AIPC, Visual Media Graphic Design, 2001. 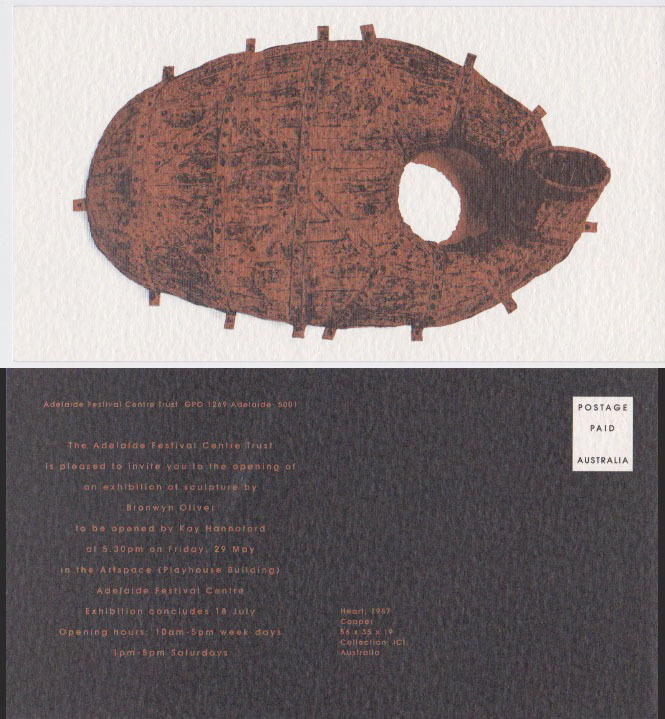 Catalogue Commendation Award 2001, sponsored by the School of Fine Arts, Classics and Archaeology, University of Melbourne: Vivonne Thwaites (curator, writer, editor), Roslyn Schumann (State President SACWA 2000) Mary Eagle and Stephanie Radok. 10 September, p 16, 2001. 'Poltergeist, Home is where the heart is' by Stephanie Radok, The Adelaide Review, October, pp 31-32, 2001. 'Celebrate the craft' by Tony Love, The Advertiser, 8 October, p 70, 2001. 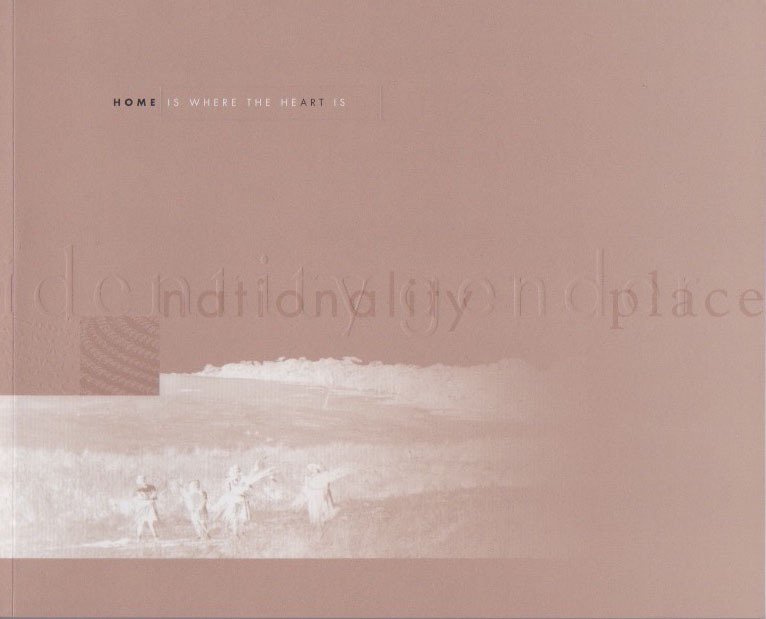 'Home is where the heart is' by Pam Zeplin, Artlink, Vol 21, No 4, 2001. 'Home/heart' by Cath Keneally, Art Monthly, No 138, April, p 44, 2001. 'Home is where the heart is', The World of Antiques and Art, July – December, pp 144-145, 2001. 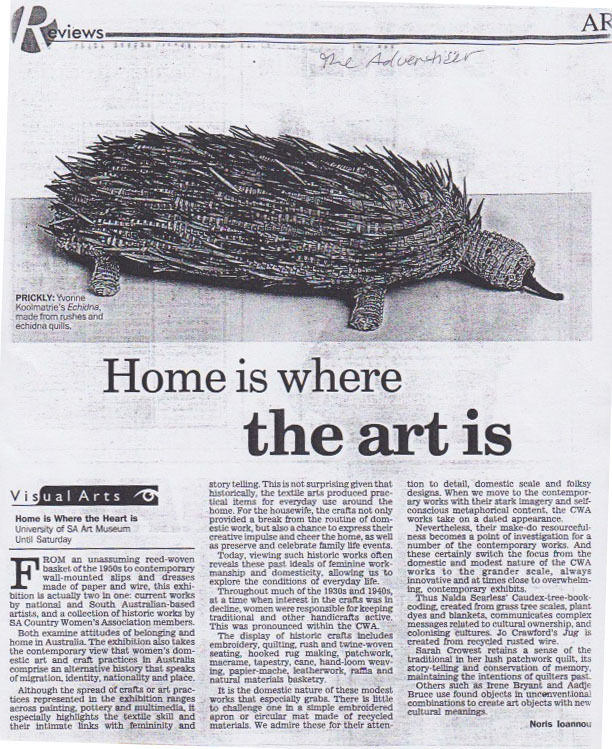 'Home is where the art is' by Noris Ioannou, The Advertiser, Reviews section. 'Home is where the heart is', The Adelaide Review, September, p 22, 2001. Swifty Coot, The Advertiser, The Arts section, 13 January, 2001. 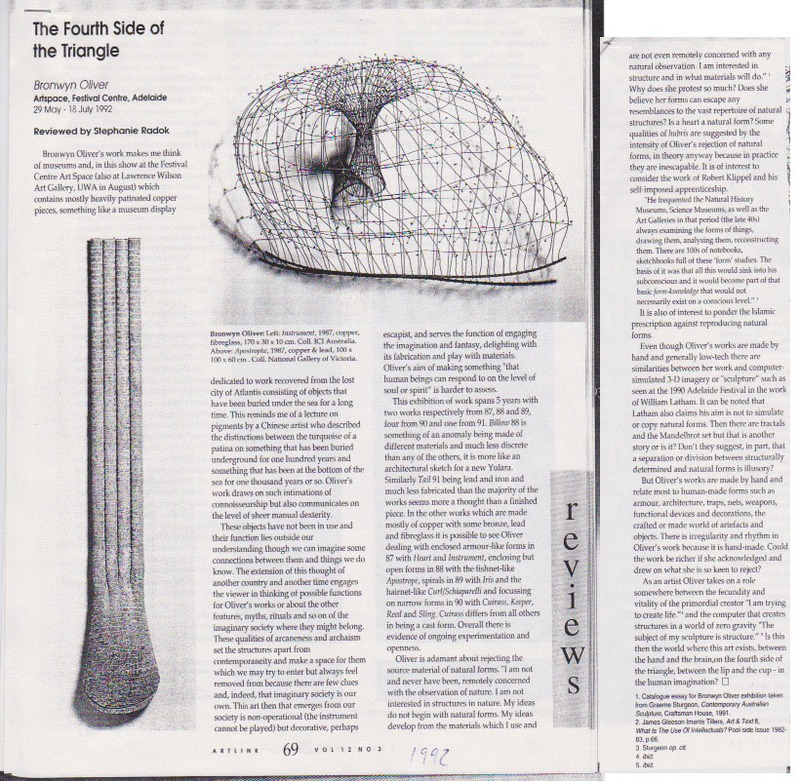 Art Notes, Art Monthly, No 14, September, p 44, 2001. 'South Australian Touring Exhibition in Burra', The Burra Broadcaster, No 511, 27 June, p 5, 2001. Nell Schofield interviewed Helen Fuller and Mary Eagle and the CWA, ABC Radio National, 25 July, 2001. A paper on this project presented by Vivonne Thwaites at the AAANZ Conference, Melbourne University, 2001. Karra/Karrawirraparri, Telstra Adelaide Festival - a project about the significance of the River Red Gum and the role of this tree in our ecosystem especially in relation to the River Murray. The artists Agnes Love, Jo Crawford, Chris De Rosa participated in this project, curated for the Telstra Adelaide Festival 2000 and funded by The Myer Foundation, Arts SA, Trees for Life and The Adelaide Festival Centre Trust. Catalogue essays by Vivonne Thwaites, Eric Rolls, Stephanie Radok, Martin O'Leary. This project was given attention in The Australian's Review of Books (Dots on the Landscape, 8 March vol. 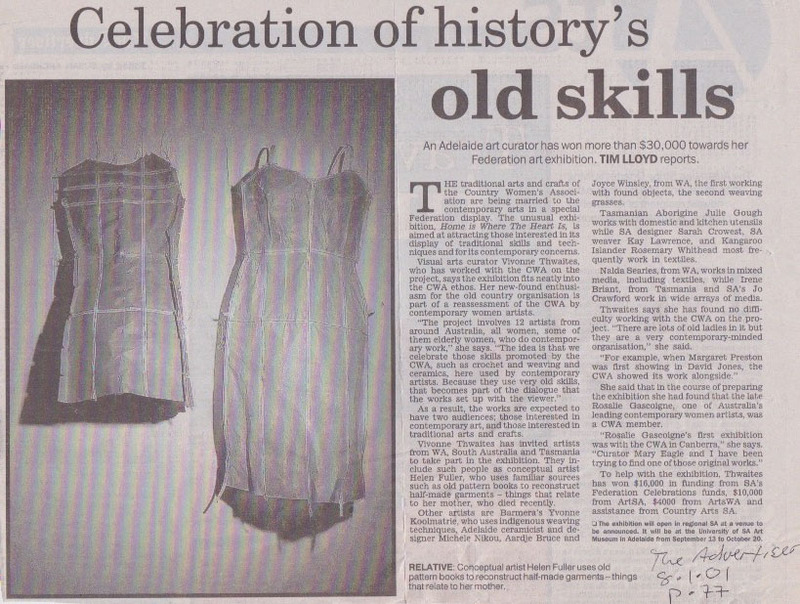 5, 2000 by Drusilla Modjeska pp 3-4 ) and was featured in The Bulletin (I think that we shall never see...September 14, 1999 by Anthony Hoy, pp 18-19). The US journal Ethics and Environment, Indiana University Press requested an article on this project: Thwaites, V. (2003). Karra: Karrawirraparri-river red gumeucalyptus camaldulensis. Ethics and the Environment, 8(1), 51-56. Three Views of Kaurna Territory Now curated for the 25th anniversary of the Adelaide Festival Centre with the Indigenous artists Darren Siwes, Nici Cumpston and Agnes Love, funded by The Australia Council and The Adelaide Festival Centre Trust. Catalogue essays by John Kean and Vivonne Thwaites. ODD business, news, finance and weather. Economic rationalist exhibition using most media. Andrew Petrusevics and Chris Gaston. was subsequently toured by Country Arts SA to Ceduna, Port Pirie, Mount Gambier, Renmark, Whyalla, Port Lincoln, Wudinna, Naracoorte, Broken Hill, Mildura, Alice Springs. Review: ‘Sport... the most accessible theatre in the world’ by Brett Buttfield, dB Magazine, No 75, 31 August – 13 September. 18 August – 1 October, serious and irreverent works by Glenn Morgan, Alan Tucker, Darren McRae, Simon Kneebone, Angelika Erbsland, Ron Hurley, Gary James, Pam Harris, Timothy J Webb, Christopher Beaumont, Carol Kennewell and other artists. Works on loan from Australian War Memorial and the Sport and Olympic Museum at the MCG. Opened by Greg Champion of Coodabeen Champions. Sponsors Balfours and Kent Town Ale. An exhibition curated for the Adelaide Festival, 25 February – 13 March. The Indigenous and non-Indigenous artists exhibited and worked in Artspace during this exhibition. Works by Ian Abdulla, Alan Tucker, Yvonne Koolmatrie, Ellen Trevorrow and Jo Crawford. 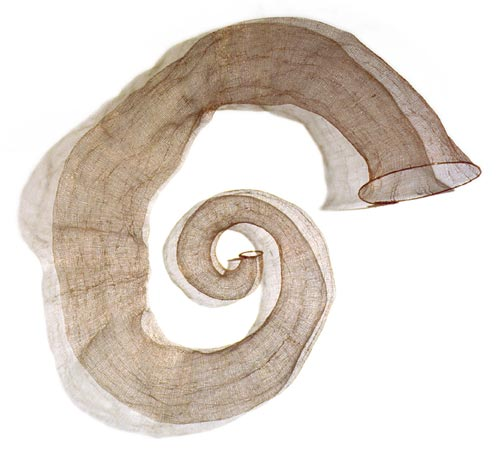 Curated by Vivonne Thwaites, essay by Stephanie Radok. Opened by Indigenous elder Shirley Peisley. Review: 'Chance to share ideas with artists' by Ruth Megaw and Vincent Megaw, The Advertiser, 10 March, p 19, 1994. Prints and banners, video and performance. Di Barrett, Lecturer in Photography, South Australian School of Art collaborated on this exhibition to commemorate the life and work of Pam Harris. Writers: Julie Ewington and Jude Adams. This exhibition received assistance from the Exhibition Development Fund of the South Australian Touring Exhibitions Program and the SA Women's Suffrage Centenary. Festival Theatre Foyer, 8 – 30 April ,1994, courtesy Gallery Gabrielle Pizzi. This spectacular exhibition of large scale cibachromes was held in conjunction with Women's Suffrage Centenary, SA, 1894–1994. Rachel O'Reilly, Realtime, 2005 review for QUT exhibition of Leah King Smiths-Strategies of ambiguity: "When the discourse surrounding archival ethnographic photography came under the control of Indigenous artists and writers in the 1980s and 90s, modes of representing and deconstructing Aboriginality moved out of the hands of white Australia for the first time. 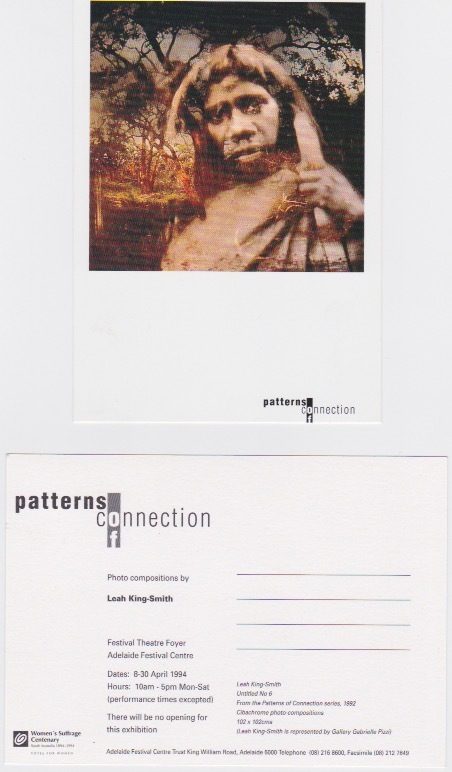 In her Patterns of Connection series (1995), Leah King-Smith was one of many contemporary Australian artists to engage with 19th century ethnographic archival photography. This recombinant, 'Indigenous' media art, colliding with the visual culture of Australia's colonial past, did much to reveal the mediated nature of Indigenous oppression and present a cogent visual history of the camera's constructions of whiteness." 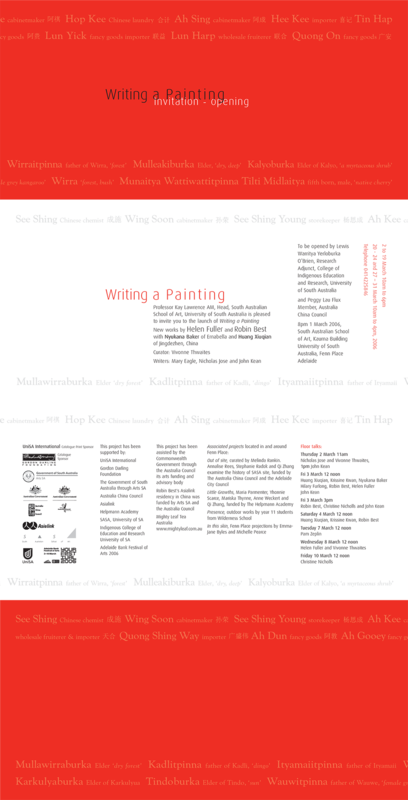 8 April – 7 May, Artspace. Women's Suffrage Centenary exhibition. Hand coloured photographic works by this Australian artist who has relocated to the US. This artist has gained international recognition and in 2001 a monograph was published on her work by the University of Texas Press. 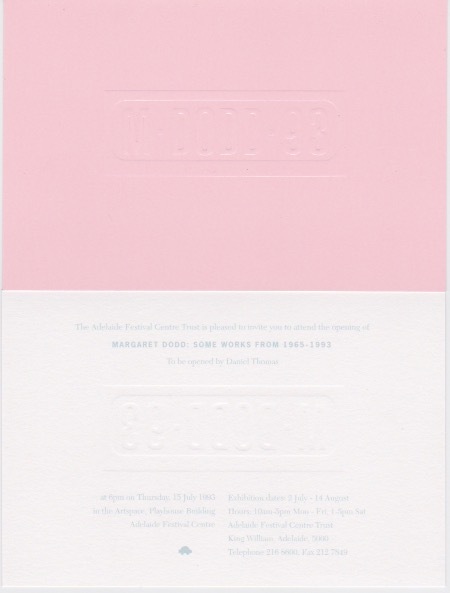 15 July – 14 August, this survey exhibition was opened by Daniel Thomas. Works on loan from ICI, the Art Gallery of South Australia, NGA and other collections. Curated for Artspace, 29 May – 18 July, this survey exhibition comprised many works on loan (from the National Gallery of Victoria, the ICI Collection, Victorian State Craft Collection, Meridian Sculpture Founders Pty Ltd and others from Christine Abrahams Gallery, Melbourne) toured to the Lawrence Wilson Gallery, University of Western Australia, August. Sponsored by ASER Nominees Pty Ltd. Spanning five years of Oliver's practice and with similarities to architectural sketches, made in copper and bronze, lead and fibreglass the works deal with form in an experimental and open way, this exhibition was ideally placed in Artspace looking onto the Hyatt Hotel's Oliver commission. 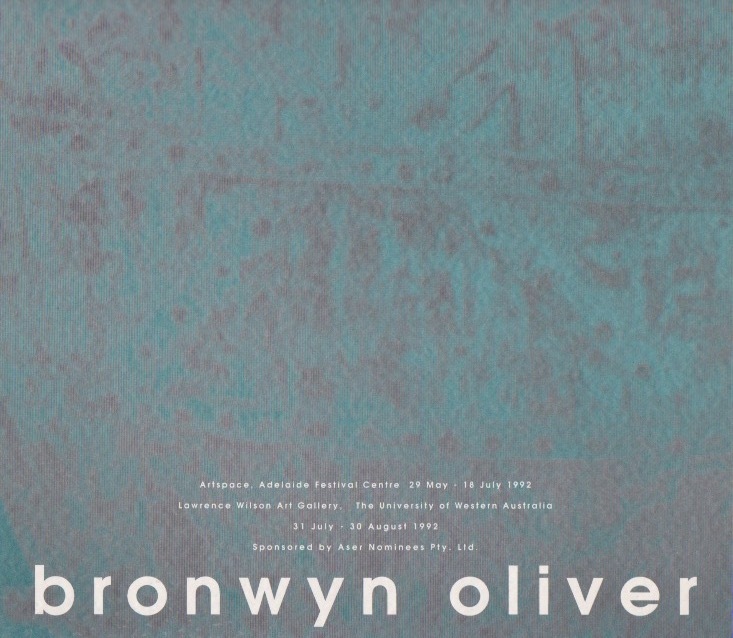 Review: 'The Fourth Side of the Triangle – Bronwyn Oliver' by Stephanie Radok, Artlink, Vol 12, No 3, pp 69–70, 1992.
Review: 'Sculptured to intrigue' by Noris Ioannou, The Advertiser, 2 July, p 13, 1992. Image: Bronwyn Oliver, Curl (Schiaparelli), 1988, copper wire, 80 × 80 × 25cm, © Estate of Bronwyn Oliver. Courtesy Roslyn Oxley9 Gallery. Jill was a founder of Merd International, Sydney, New South Wales, Australia, commenced 1984 – 1986.